Councilmember Toni Iseman also received the nod to serve as mayor pro tem, putting her next in line for the mayor’s post a year from now. 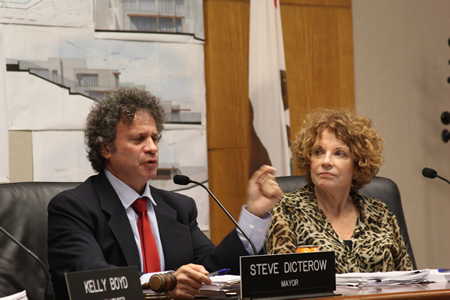 Financial matters dominated Dicterow’s first agenda as mayor. City Treasurer Laura Parisi announced that property owners would see a property tax increase of 1.525 percent next year, less than the 2 percent maximum allowed under Prop. 13. Parisi was also the subject of a discussion over her $41,000 billing request for extra work done last year related to assessment districts and securities compliance measures. City Manager John Pietig had requested that Parisi, a part-time employee, take on the project based on her significant experience in municipal finance and accounting, according to city documents. Subsequent to her work, city residents in the reassessed districts saved $570,000, and the city was able to retire bond obligations. The problem, however, was that the submitted bill of $41,900, based on 534 hours at her city paid rate of $60 per hour, was not backed up by documented hourly timesheets. In an earlier November meeting, then-Mayor Whalen indicated that he was “uncomfortable in approving the request,” based on the hours submitted, and along with other council members requested Parisi provide further documentation. Asked about her work on the project, Parisi said, “I found that the city had not complied with certain continuing disclosure obligations on their bond offerings. A bond that I did not administer did not comply. Additionally, I had to correct an SEC record on an accounting discrepancy,” she said, referring to the Securities and Exchange Commission. Dicterow and Iseman had since February been part of a sub-committee, investigating if the payment was justified. On Tuesday, Iseman could not have been more laudatory in her praise, noting Parisi’s competence, record and experience. The motion to pay Parisi narrowly passed 3-2 with dissents from Iseman and Dicterow, who wanted to see Parisi paid more than the $41,000. Separately, by unanimous vote the council also granted Parisi re-authorization to make investments for the city. Another financial measure approved without discussion under the consent calendar authorized $500,000 for the renovation of the city’s Community Services building, interior and exterior work at 479 Ocean Ave., and upgrades to the Public Works Department at City Hall. The staff report did not indicate whether bids had already been obtained. Yet a third financial item involved a consulting contract potentially worth $100,000 for retiring Public Works Director Steve May. “Steve will retire and be rehired as needed to respond to flooding disasters and to work on possible undergrounding projects,” said Pietig. Under the California Public Employees’ Retirement System, May could not perform work for Laguna Beach for 180 days after his retirement on Dec. 30, unless there is a critical need. The council undoubtedly saw that need, approving May’s contract unanimously. May, whose expertise no one on the council questioned, will be paid at an hourly rate commensurate with his previous salary (without benefits). City council members joined the city manager in praise of May’s tenure. “I want to thank Steve for his work for the city and residents of Laguna Beach,” said Pietig. May was paid a base salary of $191,718 and a total compensation with bonuses and benefits of $291,151 in 2013, according to the most recent records of TransparentCalifornia.com, which provides data on government employee pay. The contract with May included provisions that he may not work more than 960 hours a year and his tenure cannot exceed more than 12 months without council approval. The source of funding to compensate May would come from some general fund salaries, and the rest from the lighting fund, under a council decision. Iseman said she hoped the lighting fund would not be tapped for this purpose. “I am not sure what I will do in retirement,” May said. “But my wife and I have a few ideas.” With a predicted forecast for a strong El Nino, he could be back at work immediately. To those who were “outraged” (Ms. Morris and Hartley) by the Council request for documentation on Treasurer Parisi’s work, the money being spent was that of taxpayers and as such the Council has a responsibility to ensure the people’s money was being spent properly. If you think asking for documentation was rude, try submitting an invoice for payment to any well managed corproartion without backup or documentation and see what happens.